Cancer treatment involves taking a lot of medications and various other supplements. A caregiver’s most time-consuming and often worrying task is to manage those medications, which can be more than 20 pills a day. Tracking medication for Cancer can be challenging as some need to be taken in the morning and some at bedtime, once a day or multiple a day. Some are to be taken with food; some taken without food. Some are taken by mouth; some injected. Then there are eye drops, patches and creams. 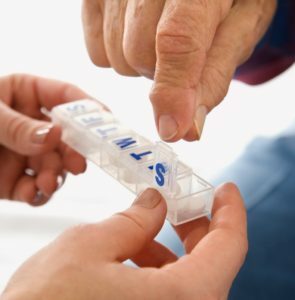 Maintain a list: Having a comprehensive list is probably the most important step in medication management. This list can help any emergency-response person to easily find the information they need to take quick action. As Cancer treatments require the involvement of several different doctors and specialists that may be at different locations, it is important for them to know what medication is taken to prevent unwanted drug interactions. If a medicine is started, stopped or changed, be sure to update the table. Take advantage of many medication spreadsheets available online for free. Pill Organizers: Using a pill box or organizer can make remembering a lot easier and helps to know whether a medicine has been taken or not. The containers come with different features – shapes, sizes, child safety locks, reminders, alarms and automatic dispensers. Some even send notifications to the caregivers if medication is taken or not. It is not always necessary to buy a pill box, you may use any container you feel comfortable with to organize the medications – like small cups. Reminders and Alerts: These days, setting alarms or alerts on the phone have become the primary way to remember to do things. There are a variety of Medicine reminder apps that can be downloaded to make tracking much easier. Also, keep notes around the home like refrigerator door, computer screen or even on calendars can help. Storage: Be sure to store medications as directed. Some need to be refrigerated; other kept out of the light. Make sure that it is at a visible place where there is no clutter. Speak to the Doctor: Ask the doctor what to do in case of emergencies such as if the patient has missed a dose or has taken extra by accident. Or if the patient is experiencing some side effects or difficulty in taking the medication. Check how to use pain medication and pain patches correctly. Speak to the care team at least once a year to see if anything needs to be changed in terms of how medication is administered. Following these basic guidelines can help take away some of the stress from managing medication of a loved one with Cancer. It will make the process easier, so that the caregiver can spend time focusing on quality time and activities with the person.